Yapahuwa, situated near Maho Junction, is a less-frequented attraction at the southwestern corner of the Cultural Triangle, though almost all visitors taking their time to climb to the summit and also visit the cave temple and museum will agree, that for travellers intersted in ancient history, Yapahuwa is one of the most rewarding sightseeing attractions found on the island. The reasons for this assertion are: Yapahuwa is a heritage site in a pretty charming setting, it has more than one attraction to offer, it is the location of an interesting part of the island’s history, the function of the former buildings remains to be somewhat obscure. All in all, there is quite a lot to discover in Yapahuwa. Last not least, a visit of Yapahuwa can be enjoyed without any touristy atmosphere. If you are looking for a major attraction that is not overcrowded, Yapahuwa can be recommende for your shortlist. 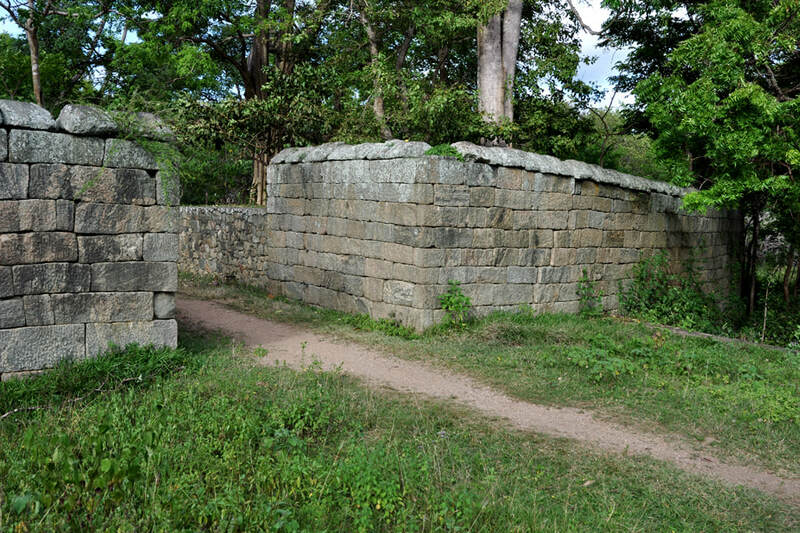 Traces of ancient defenses can still seen, a rare sight in Sri Lanka. 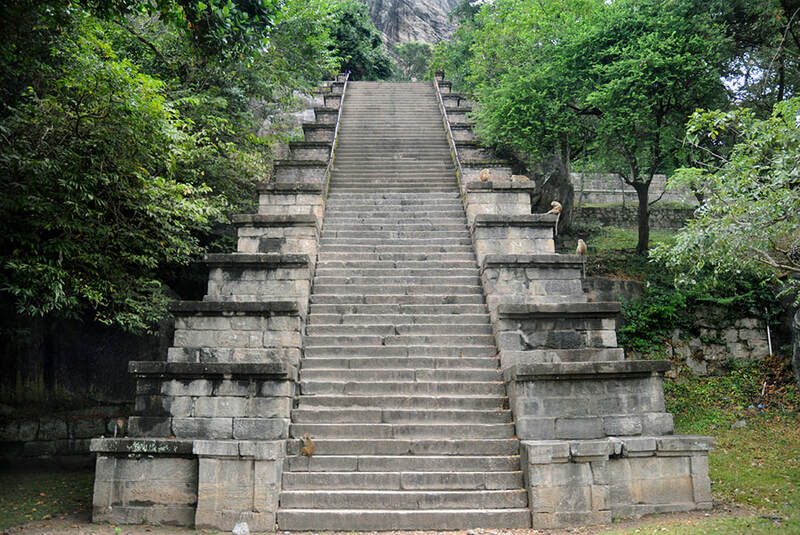 Yapahuwa’s most remarkable attraction, however, is the ornamental stairway, which is of a unique design and covered by plenty of excellent stone carvings. The steep stairway might give you a feeling of climbing a Maya pyramid in the jungles of Central America. 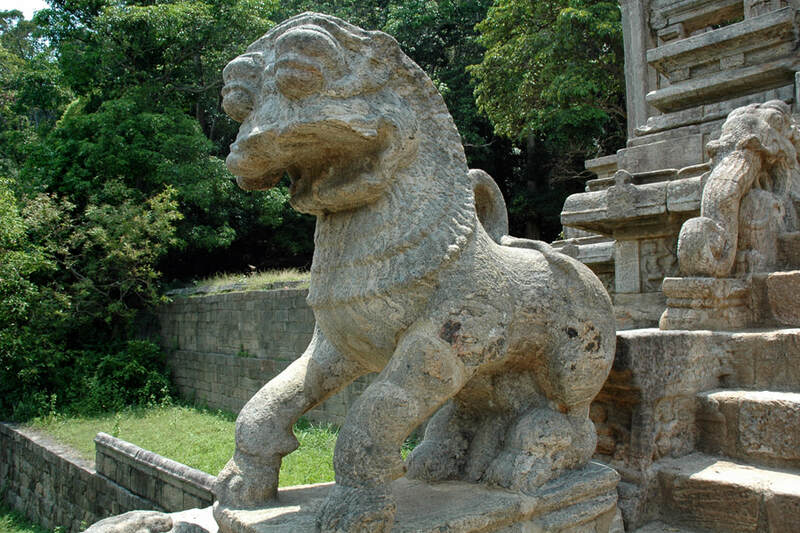 One of its outstanding stone sculptures is the “Yapahuwa Lion” bringing to mind the style of Chinese lion figures. Yapahuwa’s impressive specimen of Sri Lanka’s heraldic animal can be seen on the 10 Rupees note. 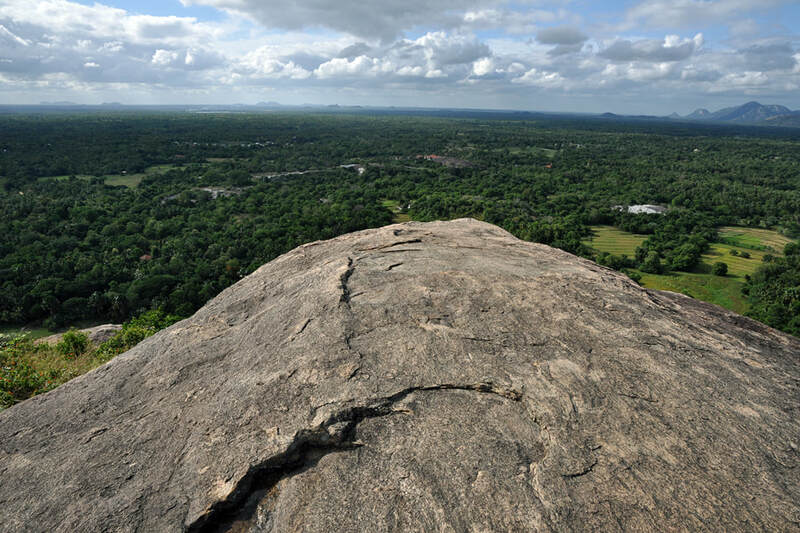 Furthermore, the summit of the rock is a breathtaking vantage point overlooking the plains of Kurunegala District, a region also known as Wayamba. Yapahuwa likes to be called “Sri Lanka’s second Sigiriya”. Indeed, there are some striking similarities. 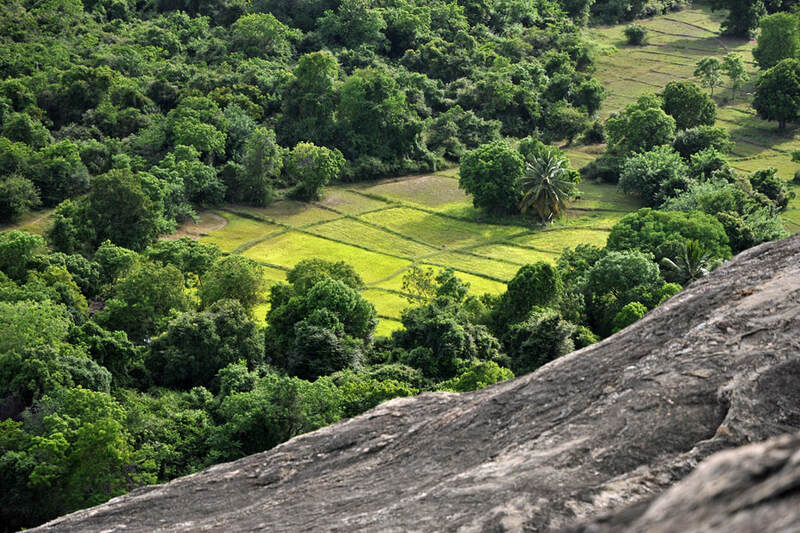 Like Sigiriya, Yapahuwa is an isolated rock rising abruptly almost a hundred meters above the surrounding plains. Though there are ancient ruins of sacred buildings on the summit and rock sheltes once inhabited by monks at the base and halfway to the top, the entire complex is not a religious sanctuary in the first place, but a royal palace enlarged to an entire city. Like Sigiriya, Yapahuwa is one of the very few surviving examples of an ancient citadel on the island. In Sri Lanka, the architectural concept of Yapahuwa is unique, as in the case of Sigiriya. There are even further analogies. Sigiriya is Sri Lanka’s most significant provenance of ancient Roman coins. Yapahuwa is the island’s place where most Chinese coins. The two kinds of coins are both evidences of Sri Lanka’s international trade relations, though of very different periods. Whereas Sigiriya was the shortlived capital in the late 5th century, Yapahuwa was the island’s capital for two very short periods in the late 13th century. Yapahuwa was one of the ephemeral capitals of the post-Polonnaruwa period, the late medieval centuries of Sri Lanka’s history. 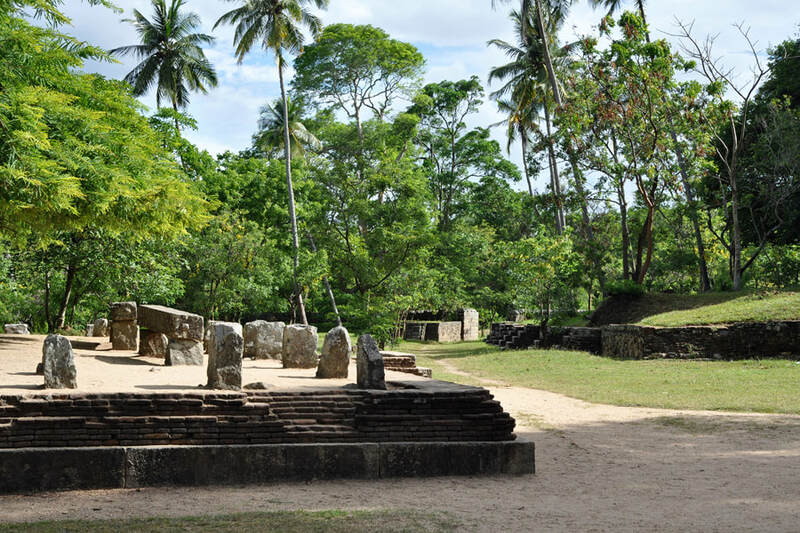 Yapahuwa was one of several shortlived capitals established during the collapse of the Sinhalese civilization in the Cultural Triangle zone in the thirteenth century. Facing Tamil invasions from northern Sri lanka and southern India, Bhuvanaikabahu I (1271–83) fortified this new royal city, protecting the national palladium, the Tooth Relic, as Yapahuwa was more easily defensible than Polonnaruwa, which remained to be the official Sinhalese capital, though the kings of the mid 13th century reigned from Dambadeniya and Kurunegala, before shifting the capital once more to Yapahuwa, later on again to Kurunegala and then to Gampola in the hillcuntry and Kotte in the tropical wet zone near the western coast. Soon after Bhuvenakabahus death, Yapahuwa was captured by the army of the Pandyan dynasty from Madurai in Southern India. They carried away the Tooth Relic to the Indian mainland. 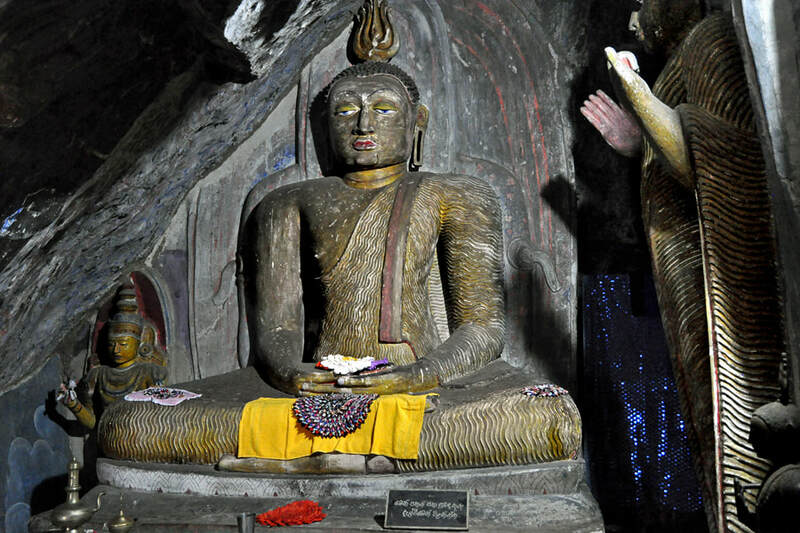 Soon after this events, Yapahuwa was almost abandoned and taken over again by reclusive monks and hermits, until it was reestablished as a cave temple during the restoration period of Buddhism under the Kandyan King Kirti Sri Rajasingha in the 18th century. Yapahuwa is located in the Mahawa Divisional Secretariat, better known as Maho. It’s the main heritage site of the Kurunegala District of the Northwesterns Province, also known as Wayamba Province. 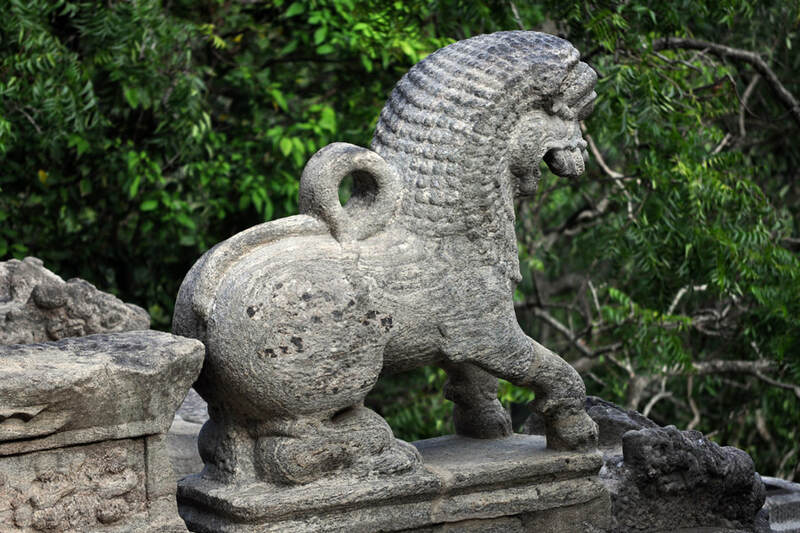 It corresponds to the ancient principality called Dakkhinadesa during the Anuradhapura period. Yapahuwa lies almost midway between the provincial capital of Kurunegala and the neighbouring provincial capital of Anuradhapura. The A 28 road from Kurunegala to Anuradhapura crosses Maho. 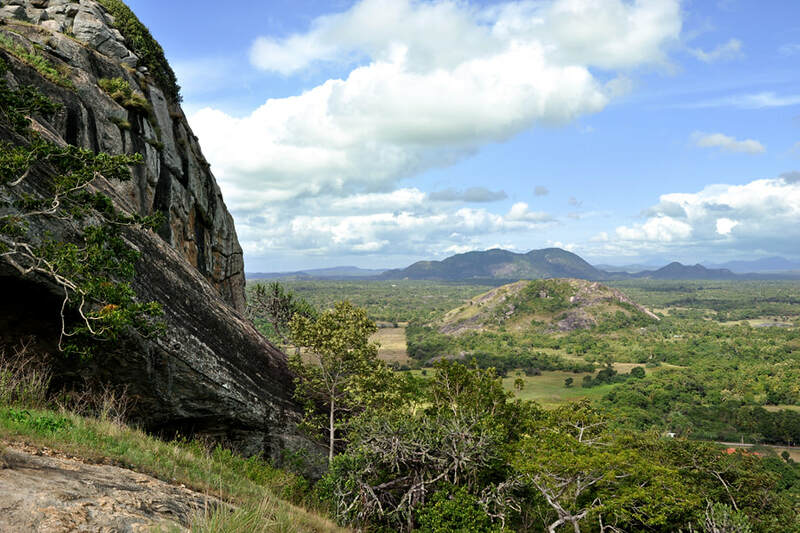 Yapahuwa Rock is in only 5 km distance to the east of Maho, which is an important railway junctions, where the railway tracks from Colombo and Anuradhapura and Polonnaruwa meet. Bus service to Yapahuwa is available from the Maho Railway Station. The term “Yapahuwa” is stressed on the first syllable. As usual in the case of Sinhala names, there are various other English transcriptions of the toponym, such as “Yapahuva” and “ Yapahu”. Actually, the transliteration of the correct Sinhala name of the site is “Yapawwa”. The term can be translated to “outstanding hill” or “excellent mountain”. The original ancient name is given in a rock inscription from the centuries B.C., namely “Sundaragiripawwa”, which translates to “Beautiful rock hill”. The Yapahuwa rock rises quite abruptly to a height of 90 m from the surrounding plains. Only on its southern side, flights of steps and terraces permit access to the summit. The almost vertical northern, eastern and western faces served as natural defence system, whereas the city to the south of the rock was fortified by walls. Yapahuwa is a gneiss monadnock, typical for the lowlands of Sri Lanka. Though the English term “monadnock” seems to derived from the Abenaki language of northern American Algonkin tribes, such isolated residual gneiss rocks as seen in Sri Lanka are typical for the former Gondwana, the southern supercontinent which once incorporated the modern landmasses, of Antarctica, South America, Africa, Madagascar, Arabian Peninsula, Indian subcontinent, and Australia. Particularly in these parts of the world, the presence of an inselberg indicates the existence of a former plateau. Starting at the visitor’s entrance entrance, which is to the southeast of the rock, visitors cross the gateways of two rings of ramparts and moats. The car park is between the outer and the inner city gate. The three outer and three inner gates were connected to causeways. The fortifications extend from northastern to the southwestern part of Yapahuwa rock. They formed a semi-circle or horse shoe to the south, the ends of which join the foot of the steepsided rock. The fortified city was not of large size. It measured 500 m from east to west and 250 m from the base of the rock to the south, plus a smaller segment of less than 100 m width to the east. The outer fortification was an earthen rampart extending about one and a half kilometres, once measuring about 6 m in height, with brick walls on the crest. No significant structures remain in the outer city between the two ramparts. Only bricks, tiles and potsherds were found in this area and in the vicinity. This part of the city seems to have been inhabited by noblemen and traders, whereas the inner city was the royal palace area. As in the case of Anuradhapura, Sigiriya and Polonnaruwa, it’s probable that the majority of the population were peasants inhabiting the vicinity, this means they were living outside the fortified part of the city, which is the citadel. The inner fortification, which measures about half a kilometres in length, consists of a 4 m high rampart, which is more elaborately covered by large blocks of gneiss stone and adittionally filled with metal. It is protected by a separate moat. The king’s palace, the Temple of the Tooth and administrative buildings were probably located within the inner wall. 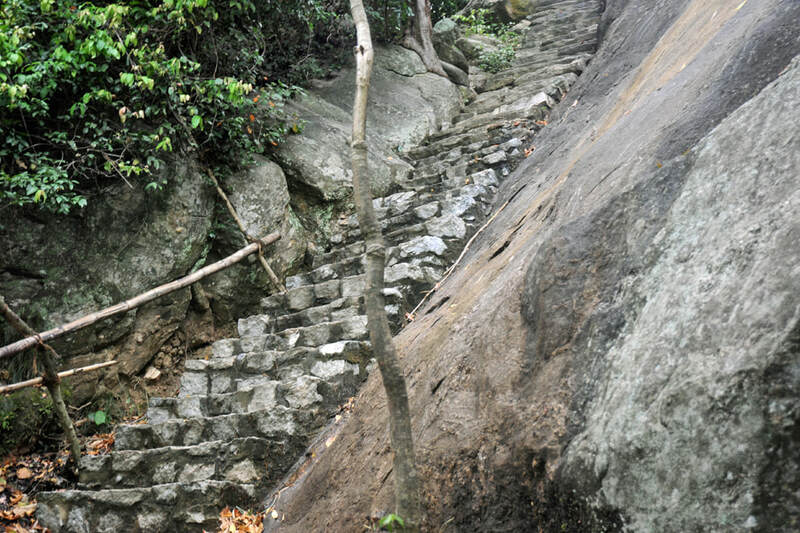 At the base of the famous stairway, to the south of Yapahuwa rock, there are foundations of an ancient Buddhist shrine. Though this structure is often called an assembly hall, no evidence can be found for this function. Two rows of stone pillars run close to the walls, but the centre of the edifice is without pillars, indicating, that this was once an atrium-like structure, with the roof only covering parts of the room and open in the middle. It may have surved as a building of the royal palace, but in fact stone architecture instead of wooden constructions was usually reserved to sacred edifices. The building is placed on a slightly elevated terrace of three small tiers. At the flight of steps leading to the hall, there are two balustrade stones with very simple carvings. To the west of this so-called Assembly Hall, there is a another foundation of much longer and narrower building. Doubtlessly, the greatest showpiece of Yapahuwa is its ornate stairway which climbs steeply up to a natural terrace which once was the site of the royal palace and presumably the Tooth Temple. This terrace in a saddle at the southern slope of the rock is in about 35 m height above ground level. The entire stone stairway was originally in three stages. The original first flight has disappeared and is replaced by 24 cement steps. The partly artificial first terrace of this first wide landing is edged by almost vertical exterior walls, which may have served as an additional inner fortification. The longest and steepest stairway is the second one which leads from the first upper terrace to the second tier, which is in front of the most elaborate ornamental stairway. The second or middle stone stairway, which can be seen from the ground level, has 65 steps. Its railings are made of boxes of decreasing size, creating the illusion of a larger height of the entire structure, an optical effect used often in monumental architecture, for example at ancient Khmer temples. The steps are narrow and need to be maneuvered in a sideways fashion. This is said to have served as a kind of defence technique. However, as in the case of Maya of Khmer pyramids, such a narrowness often indicates that the steps are not made for human access in the first place but represent the sacrality of the elevated edifices, strictly separated from the common people. In this case the structure at the top of the stairway was not just a palace but most probably the Temple of the Sacred Tooth Temple, too. 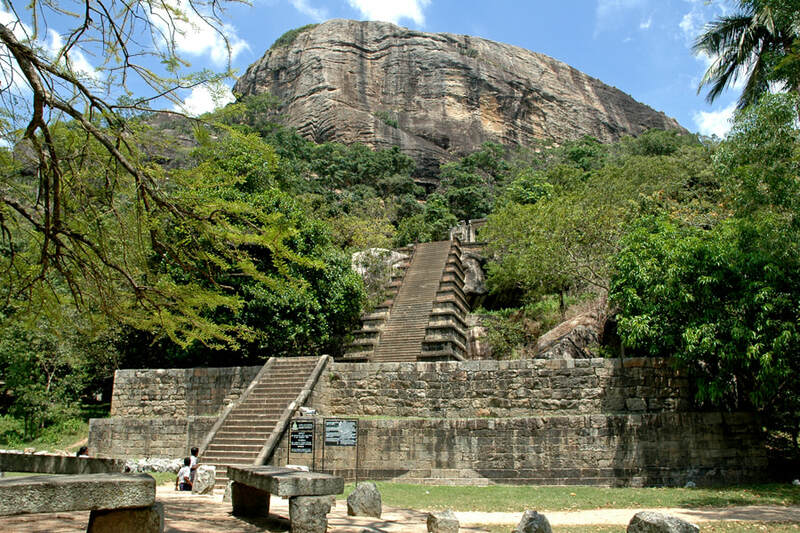 The most ornamental stairway, the landmark of Yapahuwa, cannot be seen from ground level below at the base of the rock. Rather, ot becomes visible only after climbing the long second stairway. Arriving on the second tier in front of the shorter but more artistic third flight, visitors seeing this most prestigeous edifice of Yapahuwa should not not miss to walk to the left or right, too, in order to see the stone-carved decorations at the side of the top flight, completing the impression of excellent craftmanship of Yapahuwa’s main staircase. 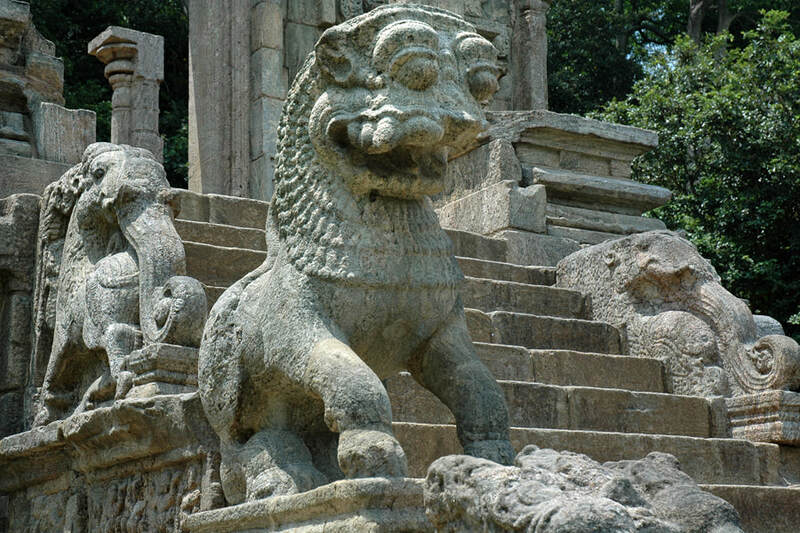 Sophisticated sculptures on both sides of the final flight of steps are masterpieces of sculptural art, the entire design is unique in Sri Lankan architecture. However, the ensemble with its acroteria resembles stairways of elevated state temples in Cambodia. Indeed, the 13th century was a period of contacts with Southeast Asia. But before jumping to conclusions, one should be aware that the main contacts were established with Thai people, who sought and reached independence from the Khmer Empire in the course of the 13th century, and that constructions of Khmer stone monuments had come to an end in the mid 13th century. 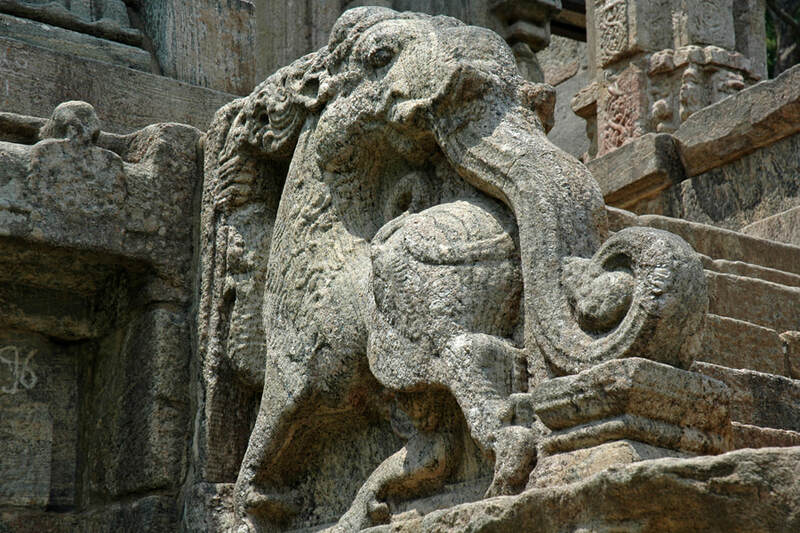 As a matter of fact, ornate stairways with animal sculptures as acroteria are also known from Indian architecture, for instance at the 12 century Hoysala temple of Bucheshvara in Korvangala. though not on such a large scale as in Khmer architecture or in Yapahuwa. The front of the highly ornated 35 step stairway from the late 13th century differs significantly from Sri Lanka‘s classical temple stairways, not only in size but also in its decorations. There is no Nagaraja or other guardian statue at the base. However, the front side of the voluminous balustrades is not completely undecorated. Simplified versions of temple decorations can be found at the base. A single Gana dwarf is on either side. 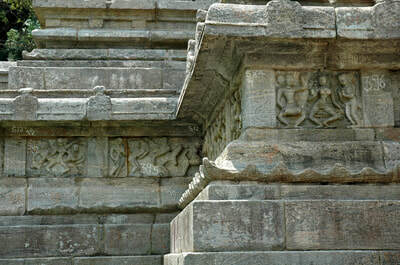 Ganas usually occur in groups depicted in horizontal friezes in classical temple decorations of Sri Lanka. The same minimalism can be seen just above the Ganas. Bas reliefs of heavenly beings, a female dancer called Apsara in this case, are framed by a circular tendrils. 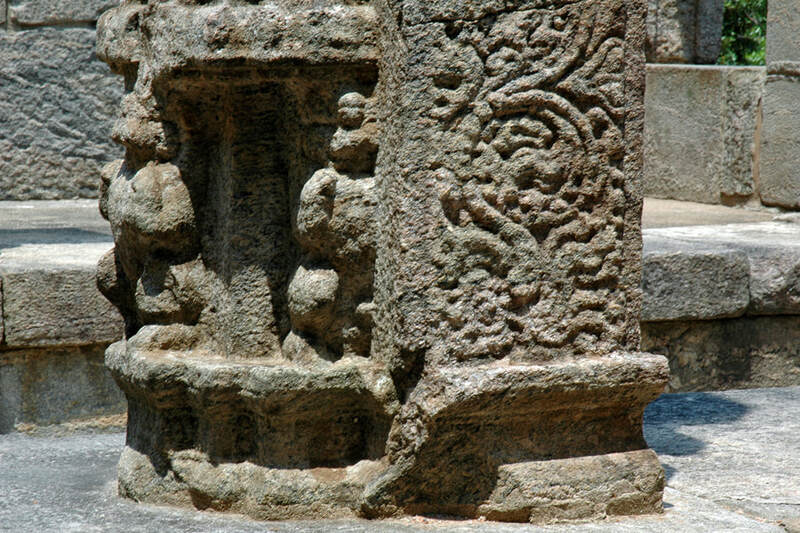 This is a reflections of the much longer creepers with many more windings that can be seen on vertical temple pillars of the Anuradhapura and Polonaruwa periods quite frequently. 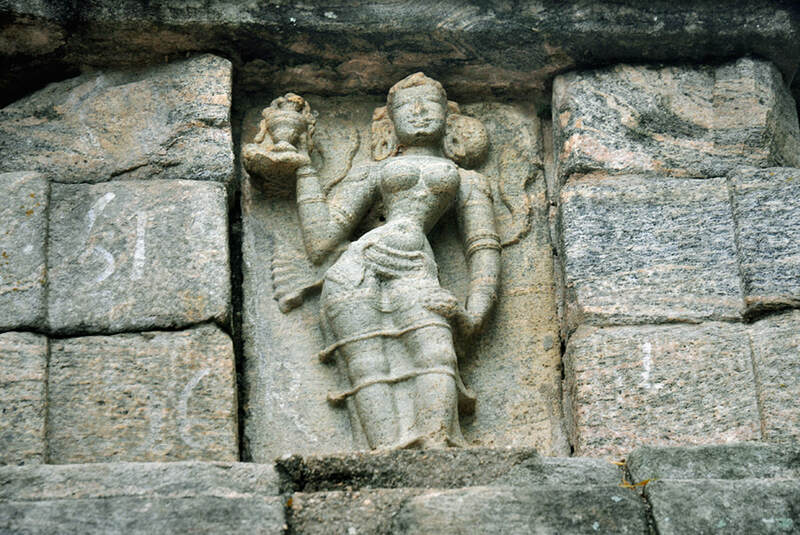 Though no Nagaraja or other Dvarapala statue is in situ, the typical posture of Nagarajas, Tribhanga and carrying a pot with one raised hand, is present in an alienated way, as a graceful figure of a female and not on ground level as usual but close to the top of the facade on either side of the stairway. The boxes on four tiers of the massive balustrades are depicted as temples en miniature, a typical motif of South Indian temple architecture: temple decoration display temples. 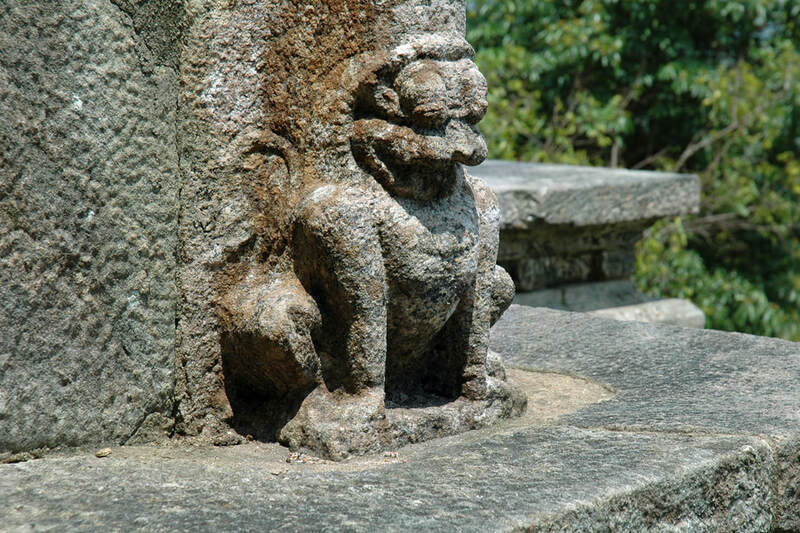 Another religious symbol of fertility can be found at the roofs of the carved-out mini-temples, namely the Makara Torana or only its upper part, the Kirthi Muka lion-monster face, tendrils growing out of its mouth. 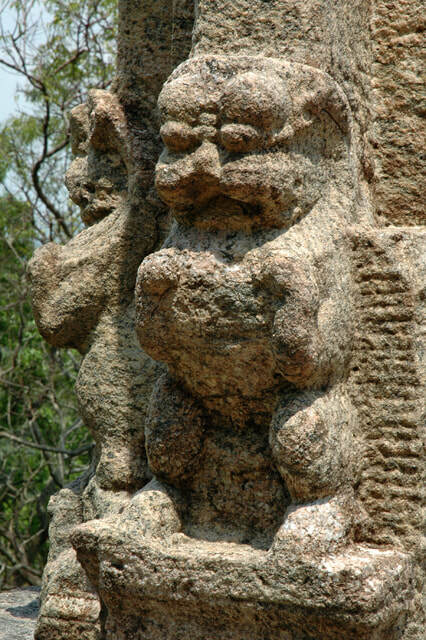 Such carved demon faces can often be seen at arches of Indian and Sri Lankan temples. The most remarkable features of Yapahuwa‘s ornate stairway, of course, are the big animal sculptures on the railings. The first one is not yet a three-dimensions sculpture but a relief, again depicting a Kirthi Mukha. It can be seen on the same level as the roof of the second box with such a lion face. Kirthi Mukha lione faces are also known as Kihimbis in Sri Lanka. The most impressive sculptures are those of the two lions. The two stylized figures are shown in a complex posture, half kneeling, half sitting. The two stairway sculptures of Yapahuwa are the largest lion sculptures of ancient Sri Lanka, in fact the landmark statues of Yapahuwa. A depictions appears on the 10-Rupee note. 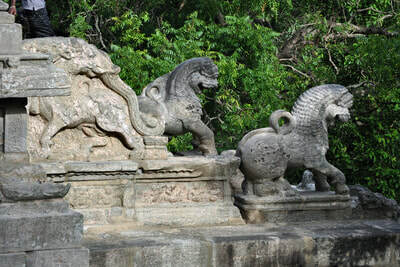 The style of these lion figures is unique in Sri Lanka. They resemble Chinese lion sculptures, particular their goggle-eyed faces with wild manes. It‘s quite possible that the design is influenced by Chinese examples. There had been maritime trade contacts between China and Sri Lanka since antiquity, but mostly not directly but by several intermediaries along the trade route. However, this changed in the 13th century. The Yuan dynasty of Mongol rulers over the Chinese Empire, which chose Beijing as the new capital, is known to have dispatched an expedition in 1284 to Sri Lanka. Emperor Kublai Khan‘s aim was to seize the tooth relic, one of the most revered relics of Buddhism. Marco Polo is said to have been aboard this fleet. Definitely, Marco Polo came to Sri Lanka on his return voyage to Persia and finally Europe, in 1293, when another fleet of the Yuan Empire visited Sri Lanka. Trade relationships of the Yapahuwa kingdom with the Chinese Empire are well documented by the comparitively large amount of Chinese coins found in Yapahuwa. Behind the lion sculptures, on the next upper level, are two more sculptures of animals, mythical beings called Gajasimhas. Their upper parts are sculptured, whereas the legs can be seen as bas-reliefs on either side. 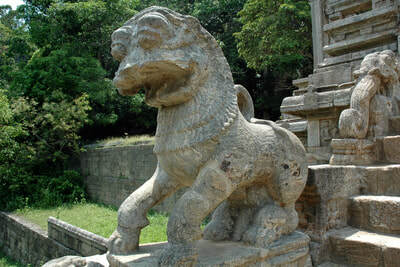 „Gajasimha“ translates to „elephant-lion“. Such sculptures have bodies of lions with heads of elephants, with tuskers and their trunk extended. The body is facing the temple whereas the face is turned to the opposite site. Such Gajasimha depictions are almost unknown in the Anuradhapura and Polonnaruwa periods, but they are depicted in Indian art already in the first millennium A.D. and they became quite popular in the art of Southeast Asia in the second millennium. From the Yapahuwa period onwards, Gajasimhas occur quite frequently in temple decorations of the Gampola and Kandy periods, also in the same winding posture at temple entrances, for instance at the Lankatilaka Vihara between Gampola and Kandy and at Kelaniya temple near Colombo. 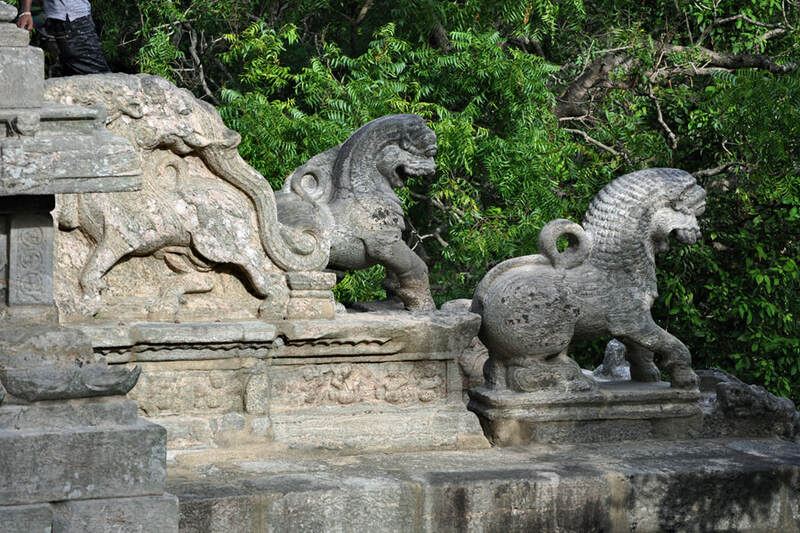 They replace the Makara balustrades of classical temples from the Anuradhapura and Polonnaruwa periods. In a way, both mythical beings, crocodile-dragons and elephant-lions, resemble each other as both are depicted which large trunks. Finally at the top of the stairway, the visitor will reach an impressive doorway that once led to the terrace of the palace, probably including the Temple of the Tooth. 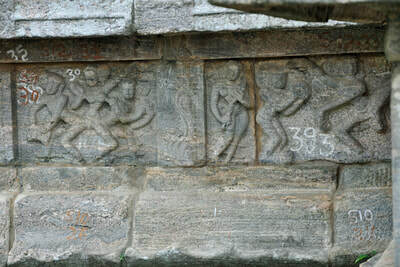 The base of the doorway building is decorated with a series of slabs depicting musicians and dancers. They cannot be seen from the stairway and the terrace below the main platform of the dorrway can not be reached easily. Thus some visitors unaware of the existence of these panels might miss to see them. That would be regrettable. In fact, these bas-reliefs are one of the most remarkable features of the architectural essemble of stairay and doorway, which in many respects is unique. The panels can be seen on almost the same level as the Lion and Gajasimha sculptures. Actually, there are two series of friezes, one on the same tier as the lion sculptures, just behind them, and the larger series on the level of the Gajasimhas. The two kinds of musicians differ significantly. 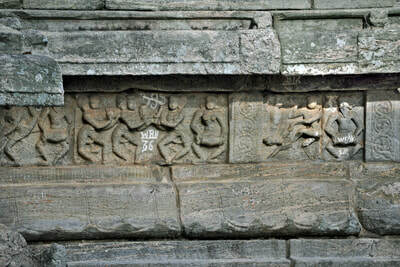 The lower panels show dwarfs, similar to those playing gnomes that are known form carvings from the Anuradhapura period. These mythical beings are called Ganas. 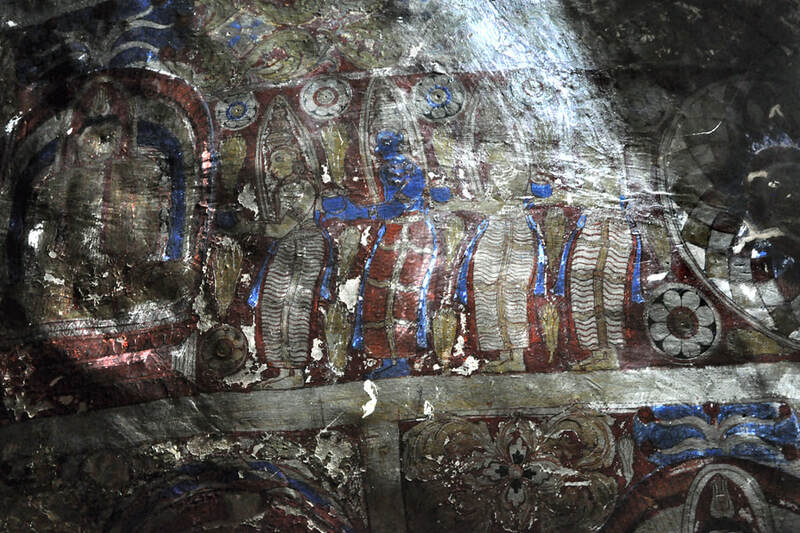 The musicians and dancers of the upper panels, however, show the shapes of human beings. Most of the panels depict one female dancer in between two male drummers. However, larger groups with two female dancers can be seen, too. Like in the traditional Sri Lankan court dance from the later Kandy period, some of the dancing positions are quite acrobatic. Each scene is distinct, not in the repetitive style of other friezes. The liveliness of Yapahuwa’s depictions of dancers is unsurpassed in Sri Lankan art history. 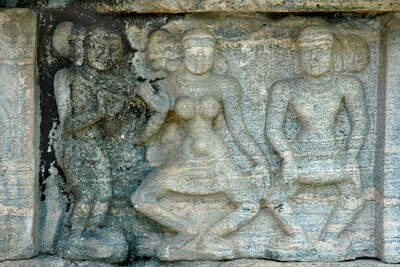 Both size and quality of the dancer-reliefs is unique on the island. Like the Gajasimha motif, the dancers and drummers have become a quite common theme of temple decoration since the Yapahuwa period. 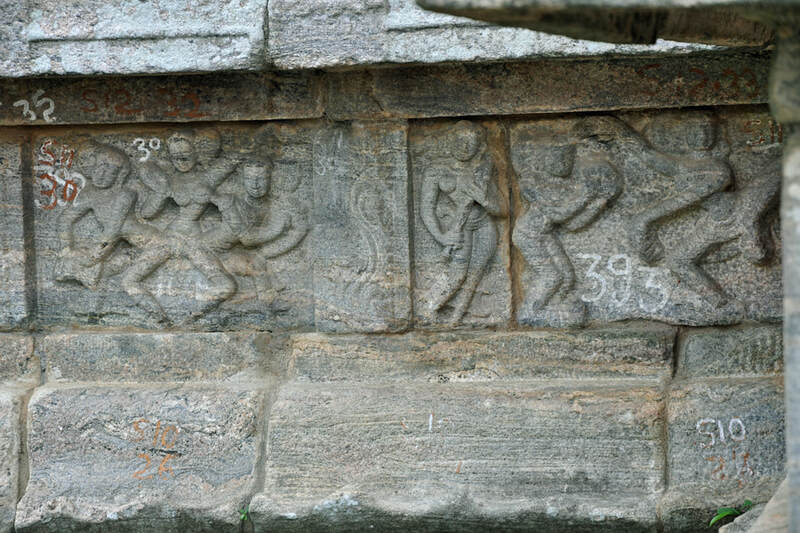 There are earlier depictions of dancers in Sri Lanka, but not on such a scale as in the case of the Yapahuwa doorway. Although such scenes are well known from Hindu temple architecture, they played a minor role in Buddhist art. It’s all the more remarkable that they appear at this monument that probably served as the gateway to the Sacred Tooth Relic of the Buddha. Drumming and dancing may have been part of the rituals at Tooth Temples in earlier periods, too. However, the decoration is actually influenced by Indian architecture. 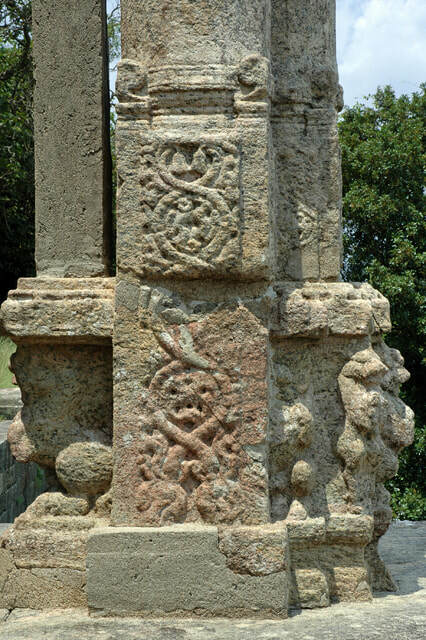 And this may also indicate Hindu influence on the religion and rituals of the island, which became obvious in the Gampola period one and a half centuries later on. The door frames and the pillars of the gateway are sculptured, too. The pillars beside the door on the upper level are of typical South-Indian design. 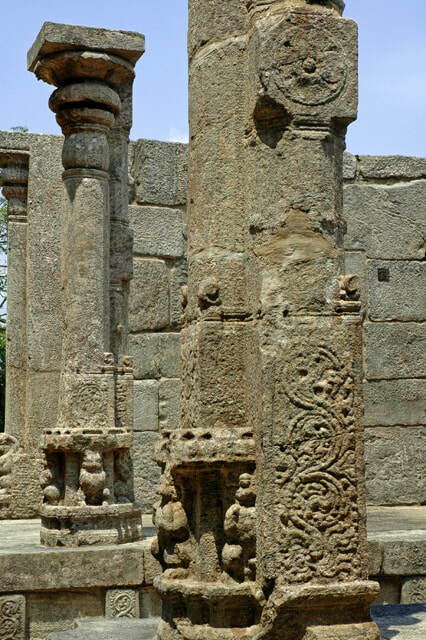 Two characteristic features of Drawidian art from the earlier Pallava and contemporary Hoysala art of Southern India occur at these pillars. Firstly, the base carries carvings of mythical beings, lions again being the predominant animal in the case of the Yapahuwa doorway. Secondly, the pillars actually consists of two joint columns, or more precisely: a pillar with an additional pilaster of almost the same volume. 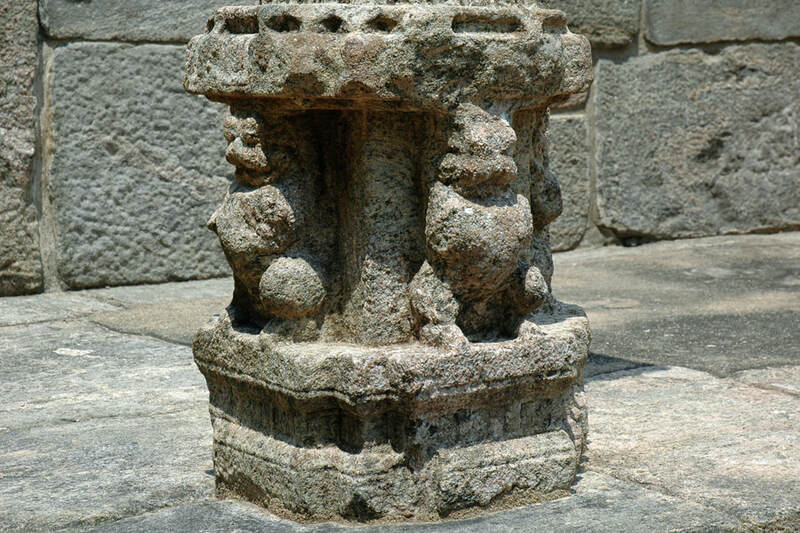 In Dravidian Indian architecture, the rear pillar is the carrying structure and the pillar to the front is the more elaborately carved one, a decorative pillar at the visible side. 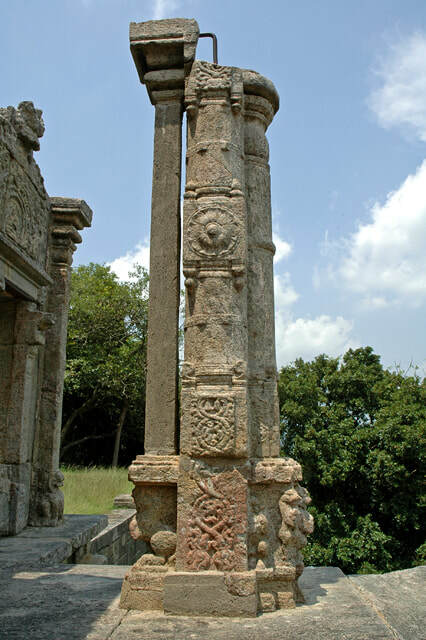 However, though the double-pillar is borrowed from classical South Indian architecture, the diversity of functions is not imitated in the case of the Yapahuwa pillars. One more gem of Yapahuwa sculpture was found at the gatehouse in 1850. Beautifully ornamented perforated stone windows were in the porches on either side of the doorway. 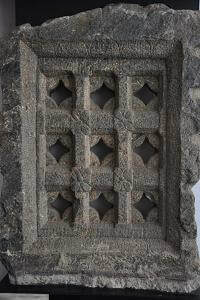 They are not in situ any more.One of these exquisitely pierced stone windows is on display in the National Museum in Colombo, whereas the more elaborate one, which had to be restored, can be seen in the Yapahuwa museum, see below. Pierced stone windows are known from Indian and Southeast Asian art, too. India’s most refined examples, ciselled in marble, are from the Muslim period. Yapahuwa’s pierced stone windows are not as detailed as those from later Moghul architecture. But in comparison to contemporary art, they are very elaborate and unsurpassed in Sri Lanka. Such perforated windows are called “Sivumenduru Kavuluwa”. Still in situ is the tympanon above the opening once filled by the stone window. The themes of the tympanon are well known from classical Sinhalese art, however, the design again is unique. 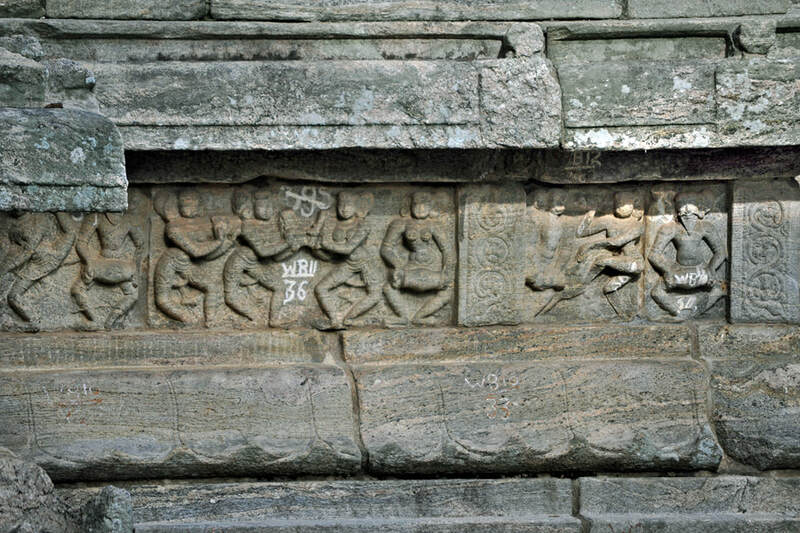 The centre shows goddess Lakhshmi bathed by elephants. Although Lakshmi, Vishnu’s consort, is a Hindu deity, this scene known as "Gajalakhshmi" has become a Buddhist symbol. It has represented the joyful birth of the Buddha since the very beginnings of Buddhist art. The symbol means: The birth of a Buddha is as refreshing as a shower experienced by the goddess. What is extraordinary in the case of Yapahuwa is the frame of the Gajalakshmi scene. Actually, it’s a common motif again, namely a Makara Torana or dragon arch. However, such a high number of bands of animals and tendrils is not known from other arch decorations. Actually, the design resembles more a moonstone than a dragon arch. But moonstones are alway found on the ground in front of temple entrances, not as vertical ornaments of walls. Passing through the ornate doorway, visitors will see some brick foundations on the terrace. The function of these buildings is not entirely clear. There is no doubt that the Tooth Relic was brought from Dambadeniya for safekeeping in a new Tooth Temple in Yapahuwa. However, which of the structures in Yapahuwa was actually the place of that Tooth Temple is still under debate. The prominent terrace at the top of the terrace may have served as the residence of the king in the first place. But it was quite common in various earlier and later periods of Sri Lankan history, that the Tooth Relic was kept in the vicinity or even within the compound of the royal palace. Hence it would come to no surprise, if the terrace served as both a secular palace and a sacred temple. 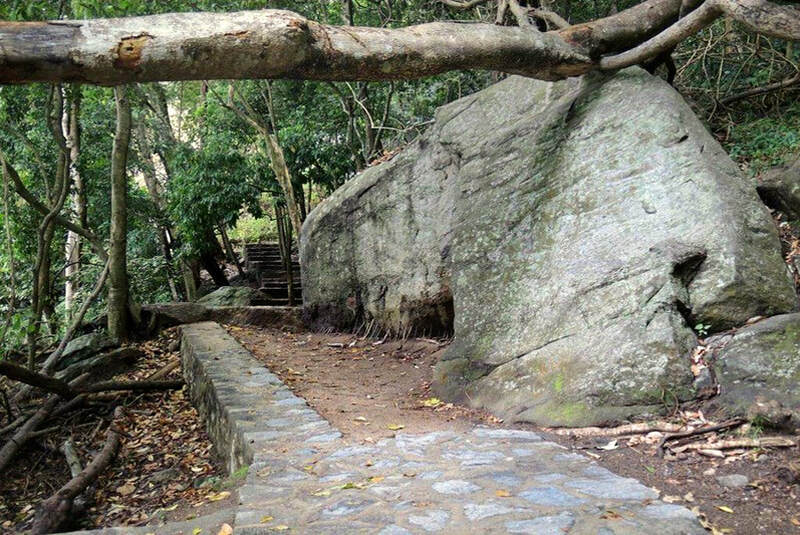 For those visitors who like to continue the climb to the summit of Yapahuwa rock, the slightly rough path to the top is to the left of the doorway. For a hiking tour, this is a relatively steep climb. But the vistas are well worth the efforts. The terrace on top contains some unidentifiable remains and a dagaba. The 360-degree view, however, is a sufficient reward for the strenuous climb. 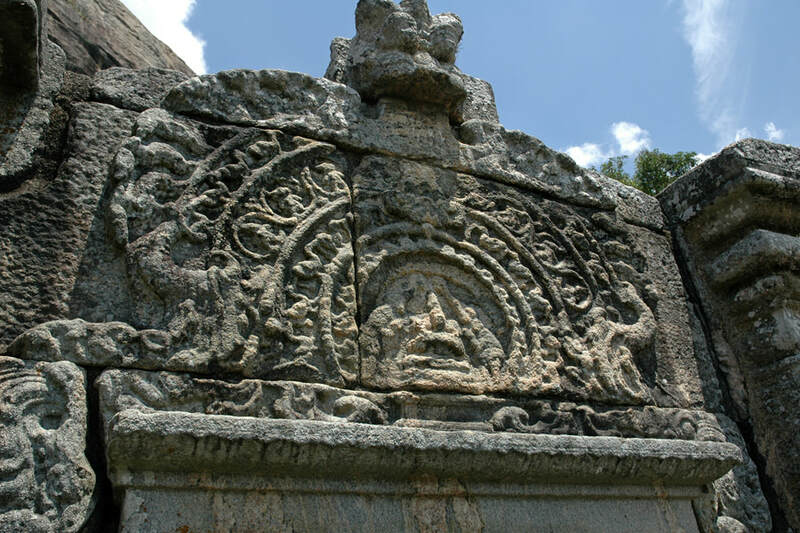 The dagaba is an ancient stupa, presumably from the Anuradhapura period. Before Yapahuwa became the capital in the late 13th century, it had been a monastery like many other rocks in Sri Lanka. Apart from the small stupa, a former tree-temple (Bodhigara) could be among the ruins the foundations of which can be seen today. The overgrown small stupa is pretty picturesque due to its spectacular setting on the very summit. 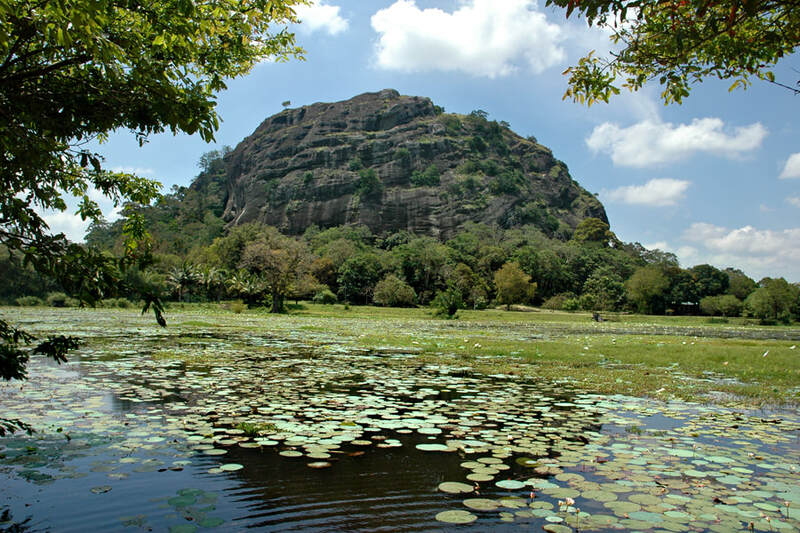 Yapahuwa is an isolated rock amidst the plains of the Kurunegala District. 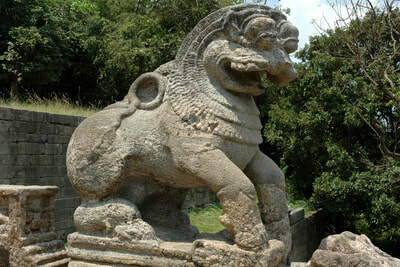 This area was known as Dakkhinadesa, “southern land”, during the classical Anuradhapura period, due to its location to the south of the capital. In the Anuradhapura period, this area was administered by the heir to the throne. Today, the not densely populated Kurunegala District, belonging mainly to the intermediate zone of zone (between wet and dry zones), is the main coconut growing area of Sri Lanka. This is the reason why the landscape is dominated by realtively dense groves of palms. In contrast to Sigiriya, the surroundings of which can be quite dry, the plains around Yapahuwa are lush green throughout the year. From an archaeological point of view, a group of rock shelters is the most remarkable feature of the summit. 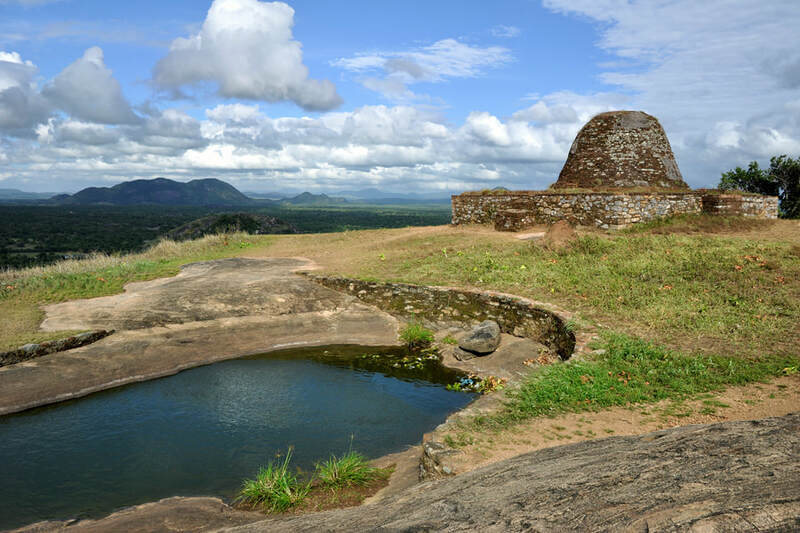 Yapahuwa, known as Sundaragiripawwa in the Anuradhapura period, is a rare example of a monastery where monks lived on such a steep rock and did not only use the summit as a sanctuary for ceremonies. Near the dagoba at the peak is a natural water tank, too, another characteristic feature of an ancient monastery. The rock shelters close to the summit are not the only half-caves of the rock and its immediate surroundings. Out of altogether forty natural caves of this kind at Yapahuwa 25 are with drip-ledges indicating they were used as dwellings of monks. Ancient Brahmi inscriptions from the Anuradhapura period are found at the drip-ledges of some of these caves. Back on ground level, another group of rock shelters can be seen that was transformed into a typical cave temple of the Kandyan period. This means, Yapahuwa is a heritage site and sanctuary representing Antiquity on the top, where the stupa and old monastery was located, as well as the Middle Ages halfway to the top, where the ornatestairway to the former tooth temple is the main attraction, as well as the early modern era at the base, where a Kandyan cave temple serves as image house of monastery till the present day. This also means, besides being a former capital and royal residence of Sri Lanka during the short-lived Yapahuwa period, this place has always been a religious site, too. The diversity of periods and functions and the amazing setting are the reason why Yapahuwa has such an extraordinary variety of heritage attractions for travellers interested in heritage sites. 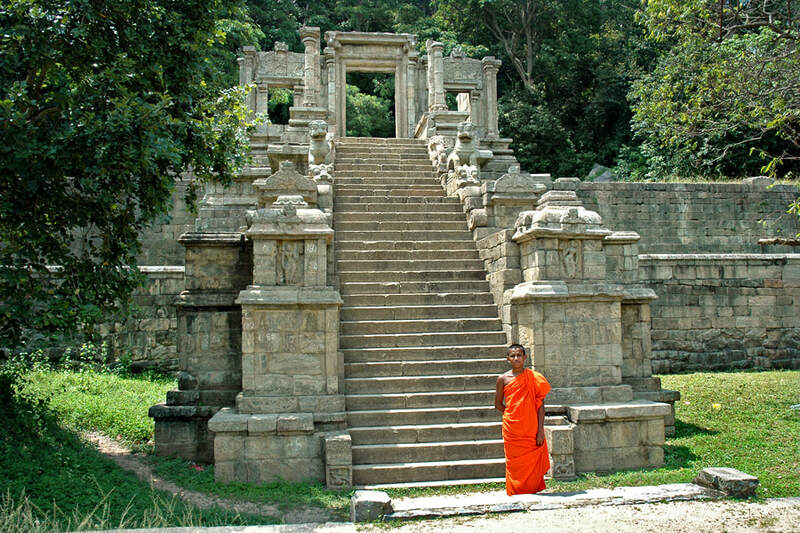 The Buddhist cave temple from the Kandy period is called Yapawwa Rajamaha Vihara, Royal monastery of Yapahuwa. It was restored in 1786 during the reign of Sri Rajadhi Rajasinha, who was the brother and successor of the famous Kirthi Sri Rajasinha, who initiated a Buddhist revival by reestablishing monasteries in all parts of the island except from coastal areas. 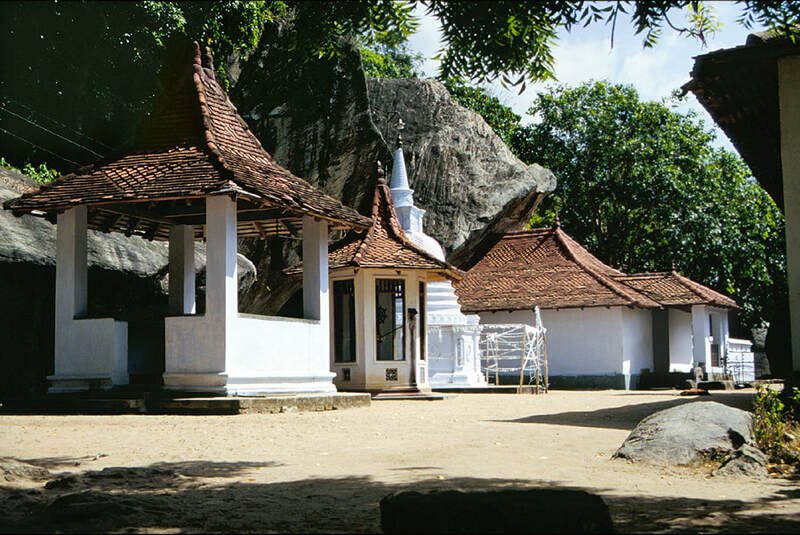 The Kandyan cave temple of Yapahuwa is situated close to the man car park. Visitors have to ask a monk for the key to unlock the temple. 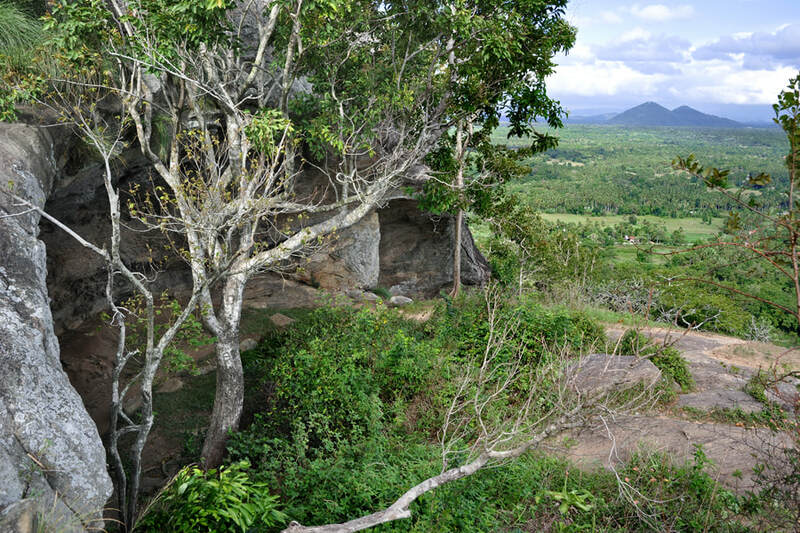 Brahmi inscriptions from the Anuradhapura period have been found at drip ledges of the Viahara’s rock shelters. The interior of the caves is new and gaudy like in many other Sri Lankan temples. 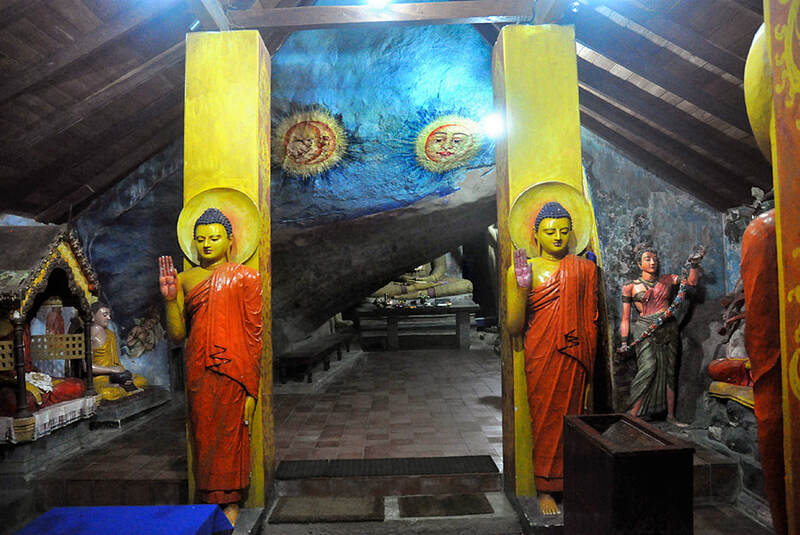 However, some remnants of historical paintings and sculptures can be found in the main cave of Yappawa Rajamaha Vihara. 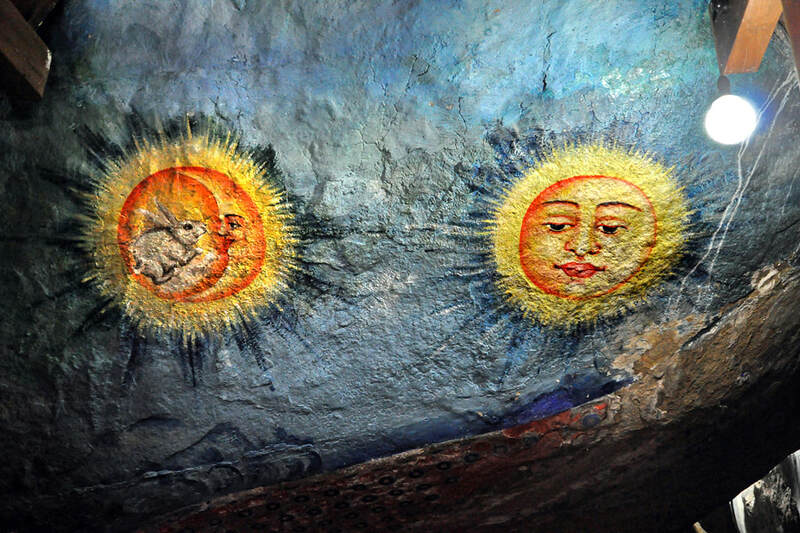 The murals in the caves are mainly from the 18th century or later, but some claim that traces of paintings from the 13th-century Yapahuwa period can also be found. The most interesting murals are those of the apex of the main shrine room. 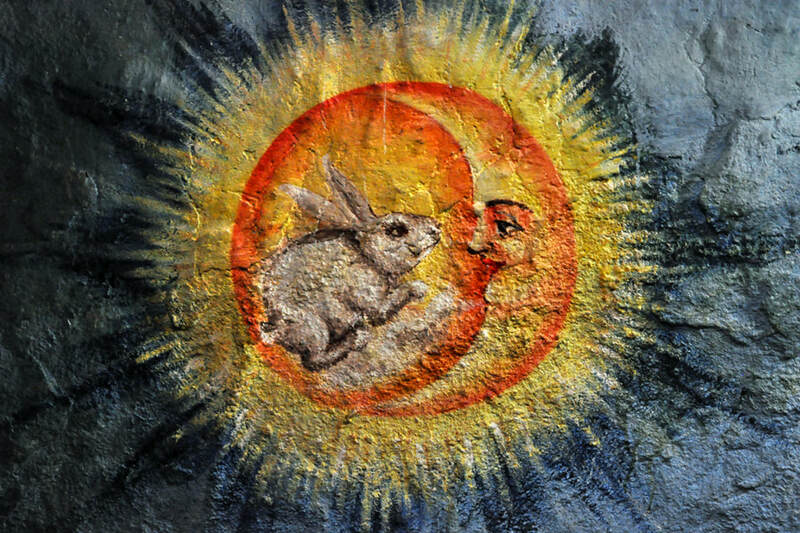 Just above the tunnel, there are bright paintings at the front of the rock, depicting of sun and moon, the latter symbolized by a hare. 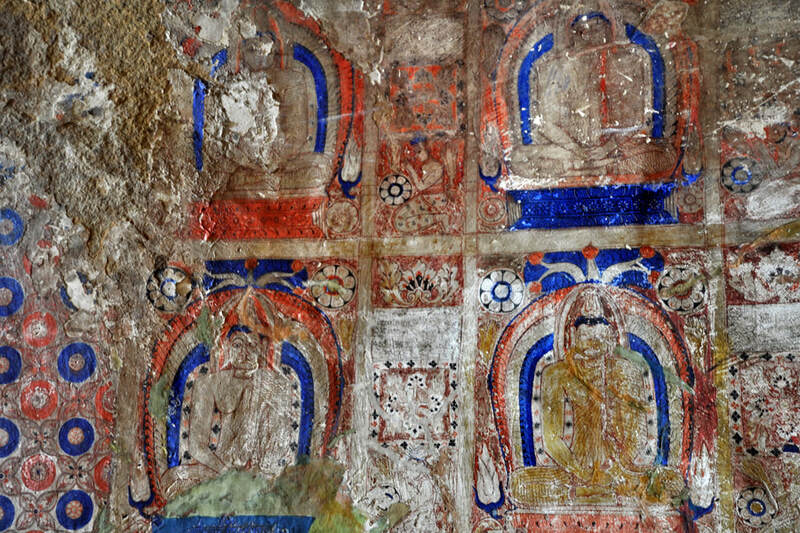 The shining colours and the blue background indicate that these paintings are not from the Kandy period but from the British colonial period or even later. Slightly older paintings in the Kandyan style can be seen in the short passage-way, the tunnel mentioned above. Lots of quite schematic Buddhas are depicted in rows and columns. They represent the 24 previous Buddhas who lived prior to the historic Gotama Buddha, most of them in eons prior to our present world age, in which 4 Buddhas have been born until now. The number of 24 refers to those previous Buddhas who met the future Gotama Buddha in one of his previous lives and predicted him that he will become a Buddha, too. This is why this motif, which is a typical sujet of Kandyan paintings, is called Suvisi Vivaranas, which translates to “24 dclarations”. The laymen kneeling in front of the Buddha figures are representations of Gotama Buddha in his previous incarnations, receiving the prediction. Though the paintings are originally from the Kandyan period those with bright colours have been restored. Again, you can see blue colours which were not used for Kandy paintings in central and northern Sri Lanka during the 18th century, because Lapislazuli was much too expensive and does not occur in Sri Lanka and indigo was then known only in those coastal areas controlled by foreign powers, this means outside the Kandyan kingdom. Most Buddha statues in the cavetemple are from the Kandy period or modern. However, some sculptures are from the Yapahuwa period or earlier. The rear of the cave is a kind of rock chapel. It is dominated by a large seated Buddha statue depicted in the common Samadhi-Mudra, the gesture of meditation. Though the garment is designed in a typical Kandyan style, the seated sculpture could be a remnant of a period prior to the restoration of the late 19th century, as it does not were the typical lacquer-like paintwork of the Kandy style. The yellow colour, however, are from more recent restorations. It is flanked by a standing Buddha, which raises hands for blessings. The combination of gestures of the left hand and right hand seems to be unique, it‘s otherwise not known from Buddha statues. The left hand shows a variant of Asisa Mudra, with the heel of the hand to the front, which in itself is a very rare Mudra. The left hand‘s Mudra with the fingers bent back to the statue‘s body is even rarer. 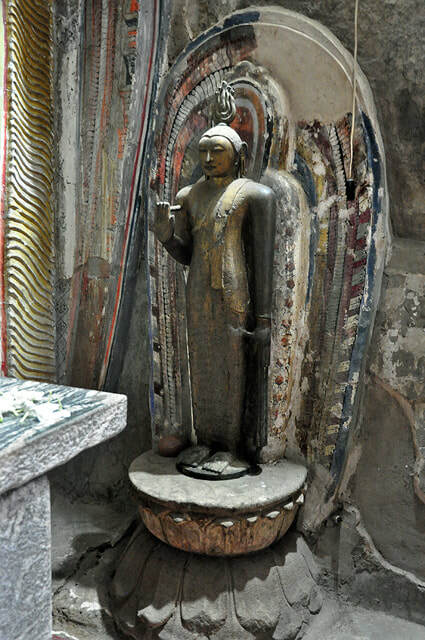 For those interested in ancient Buddhist art, the most noteworthy Buddha statue in Yapahuwa is a much smaller image below the large seated and standing sculptures. This is the single bronze statue in the cave temple. Compared to other bronzes, this apparently small Buddha is in fact surprisingly large. It is said to date back to the 13th century, being an original from the Yapahuwa period. 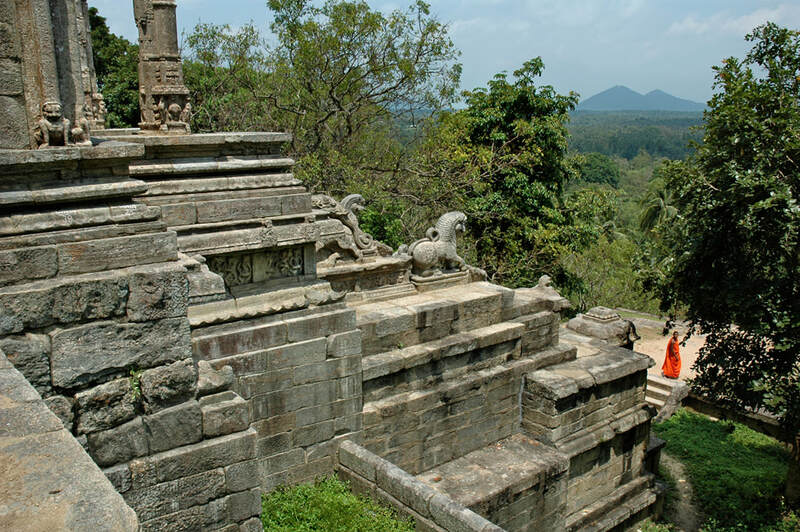 The very best bronze sculptures found on the island date back to the Polonnaruwa period. This means, they are 100 years earlier. But those Polonnaruwa bronzes usually depict Hindu deities and not Buddhas. It is not clear whether those Hindu bronzes were made in Sri Lanka or imported from mainland India. In South India, the art of bronze casting has a long tradition and reached its climax during the Chola period in the 11th century. Undoubtedly, the bronze statues of Sri Lanka were inspired by Chola masterpieces, proving continuing artistic contacts with Tamil neighbours on the mainland even after Chola rule over the island had come to an end. The local Bronze Buddha statue of Yapahuwa could be imported, too, as Buddhist bronze statues from the Chola period or later are also found in South India, although they are much rarer than Hindu sculptures. In case the large Buddha Bronze of Yapahuwa was casted in Sri Lanka, it is a unique piece of art from that medieval period. The small Yapahuwa museum, once located between car park and stairway, was shifted to a new building 300 m further south, outside the medival city walls. Impressive stone sculptures of Vishnu and Kali are exhibited in the single-room museum. Noteworthy are showcases displaying Chinese ceramics as well as a hoard of Chinese coins with Chinese inscriptions and the typical hole in the middle. This hole allowed collections of coins to be threaded on a square rod for filing or thread them on strings. Sri Lanka’s finest examples of Chinese ceramics, found in Yapahuwa, are now on display in the National Museum in Colombo. 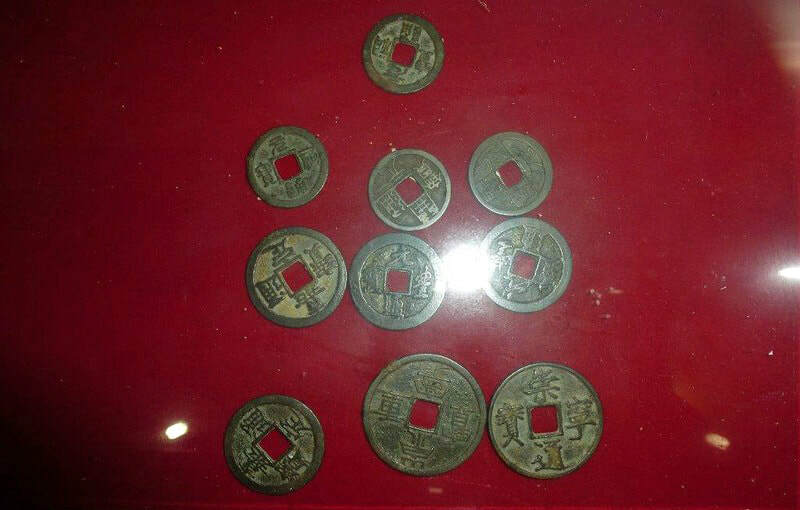 More than 1,000 Chinese coins have been unearthed in and around Yapahuwa. The ceramics and coins are the best proof for trade connections as far away as China. King Buwanekabahu of Yapahuwa had strong links with China on a diplomatic level, too. The showpiece of the Yapahuwa Museum is the pierced stone window from the palace doorway, mentioned above. This is definitely the most beautiful carved stone window of Sri Lanka. The surface is punctured with 45 circles, through which the air and light came into the hall. Inside each circle is a finely sculptured figure, each being different from the others. Among the figures depicted are women, swans and other animals. 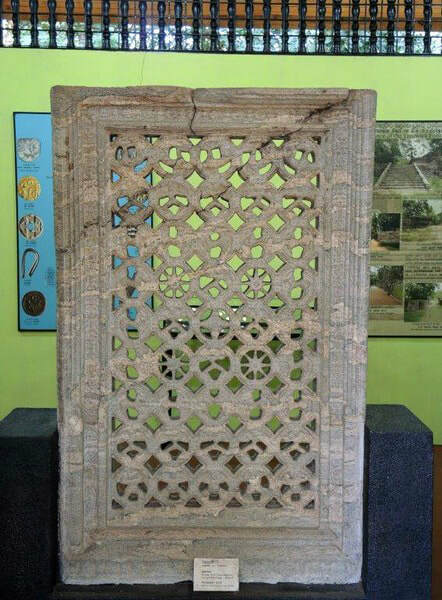 A second pierced stone window from Yapahuwa is now on display in Colombo's National Museum. The first archaeological research at Yapahuwa was done by H. C. P. Bell, who became Sri Ceylon’s first archaeological commissioner in 1889 or 1890. The Bodhivamsa,a Bo-Tree chronicle composed in the 10th century, mentions that Yapahuwa was known as Sundaragiripawwa as early as on the third century B.C. during the reign of Devanampiya Tissa, who was Sri Lanka’s first Buddhist king. As mentioned above, the rock was inhabited by a group of reclusive monks during the Anuradhapura period. 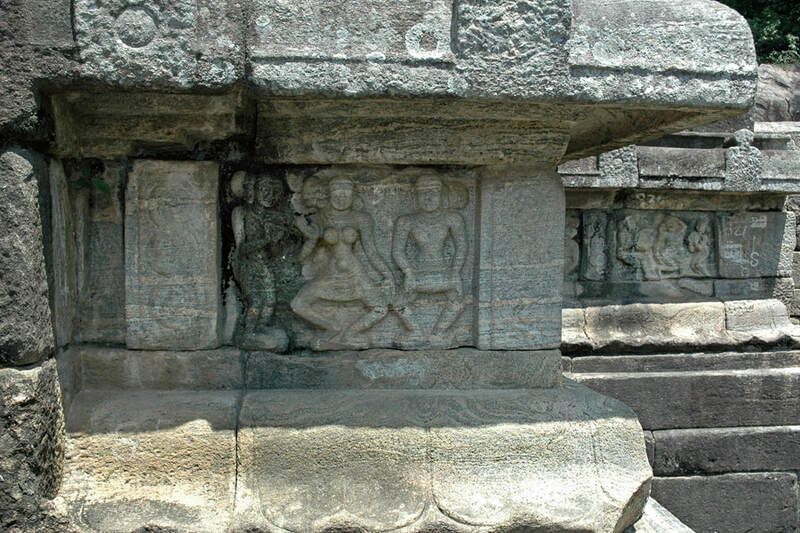 At the end of the Polonnaruwa period, the rock was was known as Subhayagiri or Subhawala according to the chronicles. It was named after the Senapati (general) Subha, who was the first to convert the rock into a fortified military outpost in the early 13th century. Subha, also knon as Subhapabbota, was the commander in chief of the Sinhalese king who had to remove from Polonnaruwa to the southwest because of the invasion of Kalinga Magha after 1215. Due to its location in between the north and southwest, Yapahuwa the isolated rock of Yapahuwa was the perfect places prevent Magha’s army from proceeding southwards. In a Tooth Relic Chronicle called Dalada Pujavaliya from the later Gampola period (14th century), Yapahuwa is mentioned as “Ayo Parvata”. The short Yapahuwa period, when the enlarged citadel served as the capital sheltering the Tooth Relic, the palladium of the Sinhalese nation, is almost identical with the reign of Buwanaikabahu I (1271-83). The 13th century saw a dramatic shift in Sinhalese history. 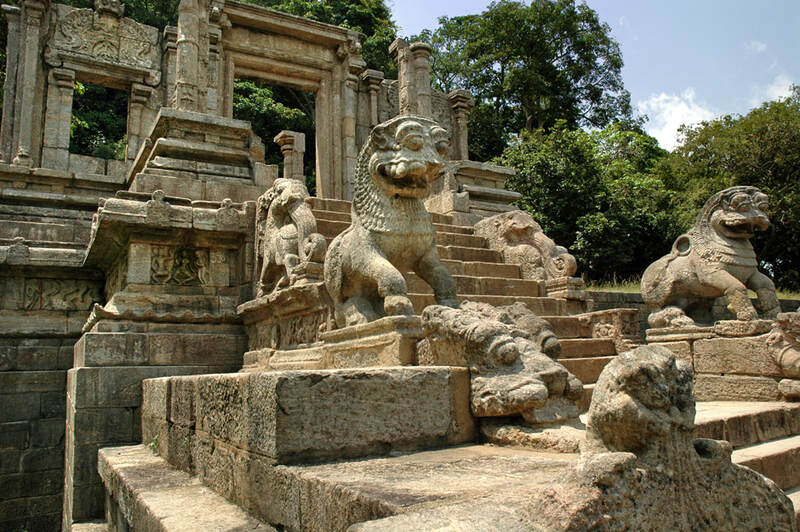 The invasion of Magha was a turning point, as the Polonnaruwa dynasties seem to have come to end, although the royal family from the subsequent Dambadeniya dynasty Sirisanghabo claimed royal descent from Polonnaruwa. The major change was not that of the ruling dynasty but that of the capital to the southwest. Unlike in other cases of previous devasting foreign invasions of the royal heartland, the Rajarata, this region now known as Cultural Triangle did not recover. The reasons are still under debate. Almost certainly, Magha’s invasion was a trigger but not the root cause of a long-lasting development. Two main reasons for the shift from the north-central plains to the southwestern wetland may be as follows: There was a general trend in tropical Asia to shift capitals from inland locations to coastal areas, as the trade on the Indian Ocean and in the South China Sea became increasingly important during the late Middle Ages. 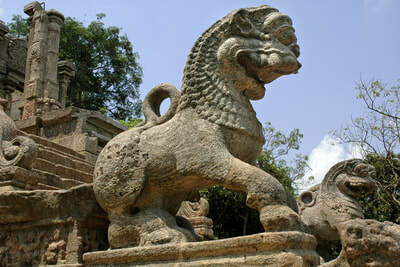 A major reason in the case of Sri Lanka may have been the highly centralized administration of the Polonnaruwa period. 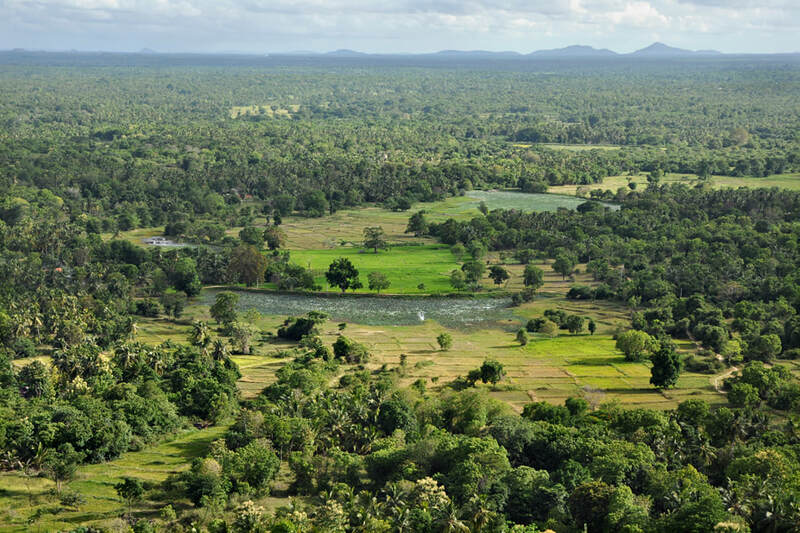 During the earlier Anuradhapura period, the Sinhalese heartland recovered from foreign invasions due to the fact that the irrigation system was managed on a local level. After the Polonnaruwa kings centralized the administration of the irrigation projects in particular, it became more difficult to maintain the irrigation system without a strong kingdom. Long periods of weak kings, that had sparsely affected the communities responsible for irrigation during the Anuradhapura period, now turned out to be desastrous for sustaining the large tanks and canals due to the lack of a central administration. The shift from the Cultural Triangle in the dry zone to the wet zone in the southwest was not a migratory movement of the population on a huge scale, it was a steady process consisting of two regional developments that have to be considered to be more independent from each other: the decrease of population numbers in the Cultural Triangle and a parallel increase of population numbers in the wet zone not dependent on large-scale irrigation projects. Yapahuwa or the end of it marks a climax of the weakness of the Sinhalese kingdom during this period. 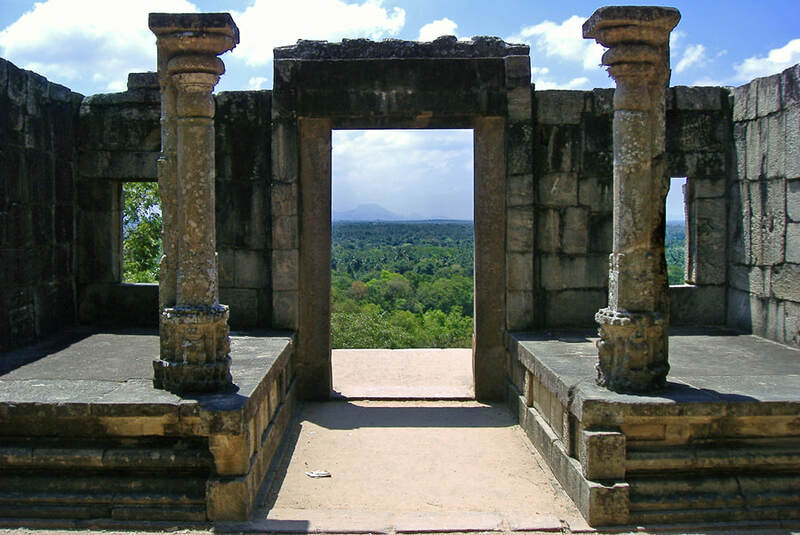 In contrast to Anuradhapura and Polonnaruwa, the capitals of the late Middle ages were heavily fortified cities at monadnocks, namely Dambandeniya and Kurunegala. In cointrast to Yapahuwa, those two cities remained to be inhabited during subsquent centuries. Yapahuwa was left and never recovered. Ironically, this is the reason why Yapahuwa is a much more attractive heritage destination for travellers today. Its walls and buildings remained unchanged and untouched. 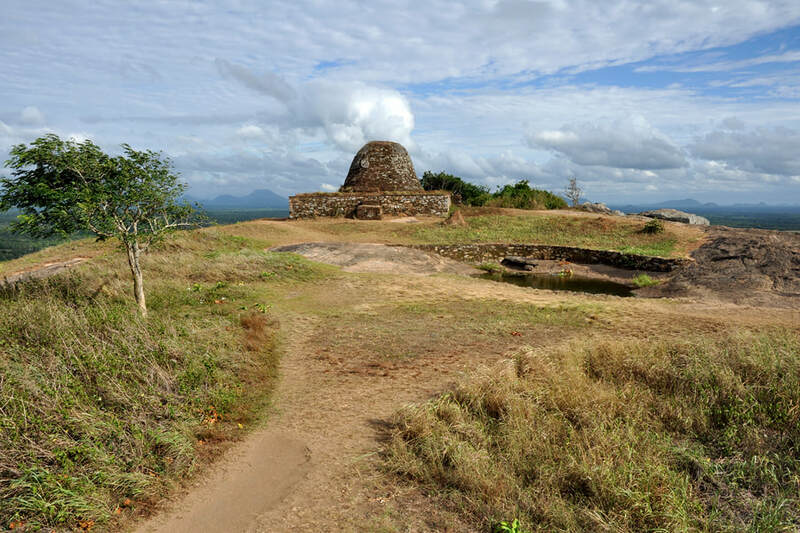 Little can be seen from the medieval fortifications and palaces and temples of Dambadeniya and Kurunegala today. After King Bhuvenaikabahu’s death, Yapahuwa fell victim to an invasion, from which it never recoverd. Remarkably, the Pandyans took with them the Tooth Relic to South India. However, Bhuvenaikabahu’s nephew and successor, Parakkramabahu III (1287–1293 or later) managed to regain the Tooth Relic during his visit of Pandyan court in Madurai. Sinhalese nationalist historiorgraphy tends to interpret the abduction of the Tooth Relic as the result of a Tamil invasion from south India believed to have captured the citadel of Yapahuwa. Though the records and archaeological findings do not provide enough evidence to trace back the true history of Yapahuwa perfectly well, it is much more likely that the fall of Yapahuwa was not part of a medieval ethnic conflict between Sinhalese and Tamil forces. In order ti understand this, the reader has to notice that not two parties but three were involved in the battles of the Yapahuwa period, two of them were Tamil and these two Tamil forces were rivals or even enemies. Actually, Tamil Empire of the South Indian Pandya king was an ally or suzerain of the Sinhalese kingdom, as both powers, the Sinhalese and the Tamil Pandyas, had a common enemy, namely the Tamil rulers of the Jaffna Peninsula. The Tamil armies from northern Sri Lanka, not those from southern India repeatedly attackes the Sinhalese forces in the south of the island. The Pandya Empire in mainland India regarded both of them as subordinate principalities. But only one of them, the Jaffna principality, defied the hegemony of the Pandya Empire, the Sinhalese kingdom did not, because it was helpful to have Pandyan support against the rivals in Jaffna. The course of events that led to the fall of Yapahuwa and the abduction of the Tooth Relic to South India seems not to have been a conquest of a Sinhalese capital by a South Indian army but the result of a punishment of Jaffna Tamil armies by a South Indian Tamil army. In this case, Yapahuwa was defeated two times. First a Tamil army from northern Sri Lanka captured the fortifies Sinhalese capital and managed to gain the Tooth Relic. Thereby becoming to mighty on the island, the Sinhalese allies in South India, the Pandyas, send an invading force not against the Sinhalese but against the Tamils of Sri Lanka. The Pandyans had already helped the Sinhalese King Parakramabahu II of Dambadeniya against the invader Chandrabhanu in the mid 13th century. In the late 13th century, the Pandyans from South India, fighting the Jaffna Tamil forces, managed to regain the Tooth Relic and took the palladium to South India for safekeeping. This is why the chronicles do not lament over the Pandyan posessors of the Tooth Relic, while they are usually condemning all other usurpers who abduct the Tooth Relic, not so in the case of the Pandyans, the allies of the Sinhalese kings. And that’s also the reason why the successor of Bhuvenaikabahu managed to regain the Tooth Relic from the Pandyan court without any combat but simply by honouring the Pandyans as a kind of suzerain. In Southasian history, visiting the royal court of another king is often a form of paying respect to him and accepting his overlordship in a purely symbolic manner for being granted undisturbed autonomy in one’s own territory peacefully. Renarrating the history of Yapahuwa in that alternative way, as a triangular relationship between two rivalling Tamil forces and one Sinhalese kingdom, which was the ally of one of them, the story contradicts those simplifying schemes of an ethnic conflict as early as in the 13th century. Rather, Tamils from South India then fought against Tamils from Jaffna and the Sinhalese were supported by the Southindian Tamil Empire and not treated as its foe. Hence, condemning the South Indian Tamils for destroying Yapahuwa and abducting the Tooth Relic may be a too hastily drawn conclusion based more on today’s ethnic-divide ideology than on a genuine interest in historical events. Yapahuwa is within day-trip distance from my guesthouse, First House Mihintale. From here, Yapahuwa is almost halfway toe the International Airport, 83 km on side roads along other attractions and 88 km on the much faster main road along Galgamuwa. Sightesseing excursions to Yapahuwa can easily be combined with visits of Nillakgama Bodhigara and Hatthikucchi or, using less comfortable roads, with sightseeing in the Aukana area. Anuradhapura is 12 km closer to Yapahuwa than Mihintale. A large variety of hotels and guesthouses is available in Anuradhapura. Beach guesthouses on the peninsula of Kalpitiya and the beach resorts of Marawila are in 110 km resp. 100 km distance from Yapahuwa. Doubtlessly, the best hotels close to the heritage site of Yapahuwa are Ayurveda Paradise Maho and Hotel Yapahuwa Paradise. The modern building of the latter, designed in a colonial style, is situated in a garden landscape with a large pond. The hotel is equipped with a swimming pool. Hotel Shanti near the main road in Maho, halfway between Maho Raliway Station and Yapahuwa Rocj, is lower in price. Cheaper accommodations are found in about 30 km distance from Yapahuwa, for example Soba Lanka Holiday Resort and The Tree in Melsiripura toe the southeast or Cocoworld Bungalow in Bandara Koswatta to the southwest.